I am an avid Alabama Crimson Tide fan. I graduated from the University of Alabama many years ago. Since the BCS National Championship was played in Miami this year, I was excited to be able to go to the game. 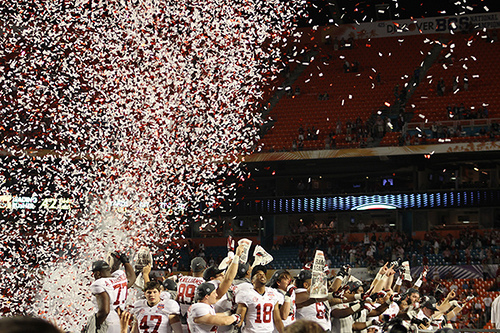 I was equally excited when the Crimson Tide won the national championship and beat Notre Dame. I had a very bad experience going to Notre Dame for a game when I was a student at the University of Alabama. So, it was doubly gratifying to win the game this year. Brian Kelly is obviously a life-long learner. Just because he’s become the head coach of the storied Notre Dame program, he has not stopped learning. I admire that in anyone. The writer of Proverbs says, Instruct a wise man, and he will be wiser still; teach a righteous man, and he will learn more. Proverbs 9:9 I’ve met a lot of men who thought they knew everything about a subject and weren’t willing to learn something new. I’ve met them in the military, in the ministry, and in organizations I’ve been a part of. If a man is not willing to admit he doesn’t know everything in a certain area and become a learner, even when he’s arrived at one of the positions at the pinnacle of his profession, he’s destined to fail again and again. I don’t think Brian Kelly will make the same mistake twice. My hope is that I’ll never be arrogant enough to think I can’t learn from someone else. And my hope is that if Alabama meets Notre Dame in another athletic contest that Alabama will win again! 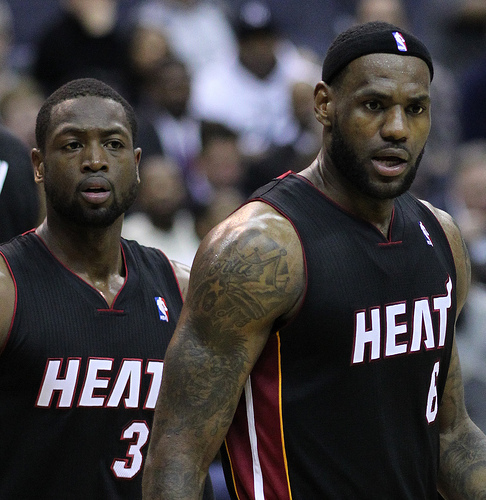 It finally happened; the Miami Heat run of 27 straight wins came to an end with a loss to the Chicago Bulls last week. I from Miami and am a Heat fan, so I was disappointed. But, at the same time glad I got to be a witness to the streak. I’ve seen every game of the streak on TV and I went to the Charlotte Bobcats vs. Miami Heat game on March 24th. I enjoyed the whole thing. The great pro-basketball player, Michael Jordan, owns the Bobcat franchise. I don’t know if he was at the game or not. He’s been extremely negative about the Heat player, LeBron James. James is clearly the most talented player in the NBA right now. I’ve even seen a spate of recent articles saying that James is better than Jordan was. I kind of get the sense that Jordan is jealous of Lebron and wants to guard his legacy as the greatest basketball player ever. Jordan recently said that if he were to chose a team with the best current players, he’d choose Kobe Bryant first because he has 5 NBA Championships to LeBron’s one. Of course Kobe has been in the league a whole lot longer, but that didn’t seem to matter. It was meant to be a slap at James. I don’t know why he had to do that. Clearly Jordan was a great player. Most retired athletes are gracious when others come up and do better than they did or break one of their records. I don’t get that feel from Michael Jordan at all. He seems more bitter or spiteful. I’m sure he celebrated a little extra when his old team, the Chicago Bull’s, beat LeBron’s Miami Heat team. But, I loved LeBron James’ response to Jordan’s comment, “It doesn’t matter to me. If you take Kobe one and I go second, it doesn’t matter. I don’t get too involved in what guys say about me or if you take Kobe or if you take LeBron. As long as I’m on the floor and I make plays for my teammates, I don’t do what I do for other people’s approval.” (My italicization) Here’s the Article. I think LeBron’s attitude is right. He says he’s not concerned with Michael Jordan. He plays for his teammates. If I were in his shoes, I’m not sure I would have said the same thing. I would have been devastated by Jordan’s comments. Criticism is difficult for me. I want people on my side. I want people to like me. Unfortunately, many times I do want their approval. But, for a Christ-follower that should never be our motivation. Paul said, in Galatians 1:10 Am I now trying to win the approval of men, or of God? Or am I trying to please men? If I were still trying to please men, I would not be a servant of Christ. In all we do, it should be for the audience of one, God. That is the only being I need to please. Oh Lord, help me remember that! So, here’s my question, who are you trying to please? 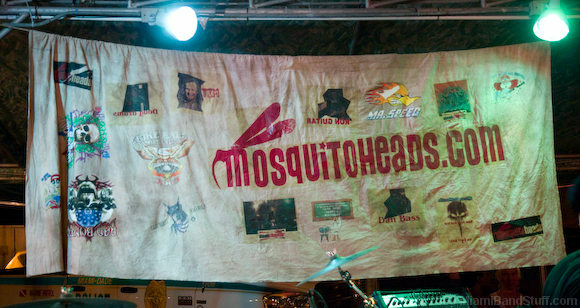 Banner from the Mosquito Heads Band Miami. I get what he was saying. Their time together was of such a quality that they really got to know one another deeply and so they made beautiful music together. That’s fellowship! I can see why he called that church. That is what the church is supposed to do. You certainly get the feel that such fellowship happened in the early church. Acts 2:42-47 (NLT) 42 All the believers devoted themselves to the apostles’ teaching, and to fellowship, and to sharing in meals (including the Lord’s Supper), and to prayer. 43 A deep sense of awe came over them all, and the apostles performed many miraculous signs and wonders. 44 And all the believers met together in one place and shared everything they had. 45 They sold their property and possessions and shared the money with those in need. 46 They worshiped together at the Temple each day, met in homes for the Lord’s Supper, and shared their meals with great joy and generosity— 47 all the while praising God and enjoying the goodwill of all the people. And each day the Lord added to their fellowship those who were being saved. I’m not sure if many U.S. churches reach that level of intimacy any more. I know it’s difficult to do in large churches because it’s hard to achieve such connection in large groups. But, if we’re honest, it is difficult to achieve in a society that has lost deep friendships. We’re so busy. Here in South Florida we go from an air conditioned house to our air conditioned car to our air conditioned work and back again. We don’t take time to really connect with our neighbors, much less other Christ-followers. The church worship service is essentially the same; we come, we sit, we sing, we hear, we sing again, we give, we leave, but we don’t really connect with other Christ-followers at an intimate level. But in order to be “like church” we’ve got to get there. If we achieve such intimacy with one another, something spiritual happens; God shows up in a big way. There’s a deep sense of awe. Miracles happen. People really support one another and even get together on their anniversaries. Part of being a Christ-follower is a deep connection with other believers. Are you connected? What are you doing to achieve intimacy with others? How are you seeing God work through your deep fellowship? Please leave a comment. 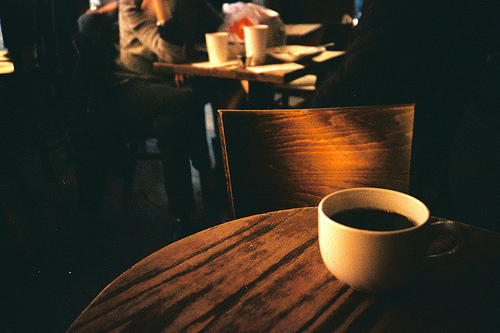 The other day I was headed into my favorite coffee shop. I noticed an older gentleman getting out of his car. He was kind of hunched over and moving very slowly. I noticed him in the store cleaning off the condiment area. I thought, “man, that’s a nice guy cleaning the table.” Then I noticed him neatly placing a stack of Our Daily Bread devotionals on the condiment table. I was so heartened and encouraged by what he’d done. Here is an old man in the last years of his life and what is he concerned about? His retirement? Enjoying the leisure life on the golf course? No, he was concerned with the eternal life of others. What an incredible legacy to leave. I wonder how many people he influenced for God through the kind act of leaving devotionals where they might pick them up. He reminds me of Caleb, who at 85 was still ready for battle. He was God’s warrior, no matter what his age. My bet is that kind of ministry keeps that godly gentleman young. I spe nt 22 years in the U.S. Army. Probably my favorite time was being a leader in a cannon battery. We had 6 cannons and I was in charge of them. We were out doing maneuvers in Fort Campbell, Kentucky in the springtime. We were moving all the cannons to a new place to fire from and went through an area full of mud. We had 4 or 5 vehicles stuck in the mud. Have you ever been there? Have you ever been stuck in life? Not much is happening. Everything is pretty much staying like it has been. Not much new. I certainly have. It’s time to get a new wind blowing in your life. Song of Songs 4:16 Awake, north wind, and come, south wind! Blow on my garden, that its fragrance may spread abroad. Ask God for a new breath of his Spirit. Ask him for a new wind to blow in your life, so that what he does in you may spread around to others. Oh, we did get the cannons out of the mud. We were able to carry on the mission. With God’s work in your life, you too will get unstuck. Now obviously I didn’t know what that meant at 3 years of age. But, yes I had heard it before. It was actually one of my dad’s favorite curse words. I remember hearing it later as I grew up. Well, needless to say, my dad was embarrassed. I’m not sure what the pastor thought. Parents be careful what you say. You may not think you’re being listened to, but you are. Make sure it’s something you wouldn’t mind having repeated. Parents be careful what you do because your children are watching you. Check out this video (here) on the subject by Veracity Project. Philippians 3:17 (NIV) Join with others in following my example, brothers, and take note of those who live according to the pattern we gave you. Let’s make sure that pattern is a good and godly one. Rueben Foster recently committed to play football next year at the University of Alabama. He has an interesting history. He grew up a fan of the Crimson Tide. In fact, he committed to play at Alabama before his senior year in high school. But a little over a year ago, moved to Auburn, Alabama for his senior year. Auburn is the in state arch-rival of Alabama. After moving to Auburn, he changed his commitment from Alabama to Auburn. In order to show his allegiance to his new school, he had the Auburn logo tattooed on his forearm. That wasn’t really a problem until February 6th when he change his commitment once again back to Alabama. Now, he’s going to go to the University of Alabama sporting a HUGE Auburn tattoo. That’s going to be really weird next year when he’s playing for the Tide against the Tigers. Some decisions are permanent. Be careful with your choices. One of my biblical heroes is John the Baptist. What a tough dude. He was bold. He actually confronted King Herod because the king had taken his brother’s wife to be his own (gross—but that’s another blog post). Well the king put him in jail. On the king’s birthday, his wife’s daughter danced for Herod and a bunch of his friends that were there to cut a cake. Herod enjoyed it so much that he offered the girl whatever she wanted, up to half his kingdom. She asked for John’s head on a platter. The deal is the Bible says he wanted to kill John but he feared the people because they saw John as a prophet. So, he’d decided he’d not do it. But, since he said it in front of all his friends, he had no choice. Be careful what you say (especially in this internet age) because once it’s out you can’t change it. Be careful what you do. Once you’ve done something, you may not be able to change it. Be careful with your choices.